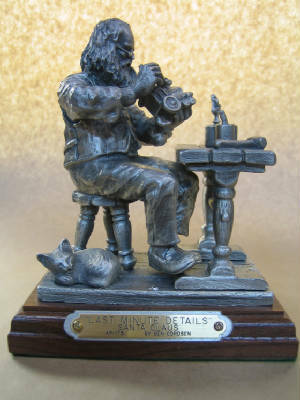 We have been in business since 1987, and pride ourselves on providing customers with the best-quality cast pewter and bronze products and personal service. You can order from us using our online catalog, order over the phone or fax, or visit one of the retail locations that carry one of our unique commissions. We take pride in hand crafting our sculptures, and hope that you'll find something in our catalog that you like. We also can create custom sculptures; call or email and let us know what you want. Please use the navigation tabs to go into each of the galleries in the portfolio section for detailed photographs of our products. The sculpture on this frontpage will vary with each season, please check back frequently as new sculptures are added monthly in each catagory.